This is a period correct camp, with full amenities. Flush toilets, showers, wood and water provided. This is a historical site so no dug fire pits. The staff have fire rings for our use or bring a brazier. Event begins on Thursday and ends on Sunday, checkout the schedule for more info. ​The map below gives you the location. You may drive in to set up. Follow the service road to the north of the information center. Once your camp is set up, you may park on the South side of the fort, staff will be around if needed. There are still some road closures in the Omaha area. Check 511 for more info. I29 is still closed from Saint Joseph to Omaha. The fort is not flooded and everything is going as planned. See you in a week! As my modern alter ego, Dave Dittmer, I have been rendezvousing and re-enacting since 1983. We all had to start somewhere and I hope no early pictures show up. I spent much of that time playing Mountainy man on the plains and in real life was a portrait photographer for 20 years. In 1995 I got some metal sheets at an estate sale and that began my interest in silversmithing. I had a good friend who was a smith and wanting him to make some things for me, he declared he was very busy but he would spare a Sunday afternoon to give tutelage. So my formal training was a few hours on a Sunday and from there I have, as most metalsmiths, developed my own techniques and learning curves for my work. Just like Zebras---no two of us are alike, but if you look close you can really tell us apart. In 1995, I started to make trade silver, not well but I made it. As time progressed I got better and started to sell things and made it a part time job from my regular work as a photographer. In 2000 I wanted very much to leave the company I worked for, so along with my wonderful girlfriend, Sue Minor, took the scary leap into fulltime, traveling, itinerant silversmith. Sue was sure we would starve the first year. So, now as we are in the year 2019 and 24 years later from my beginning, I have developed a wonderful clientele across the US, Canada, the UK and several European countries. I actually did get better as time went on, even today I still improve my work with each piece I make. Through many years of study and research I have been able to lecture on trade silver at The Eiteljorg Museum, which is a nationally know museum of the American Indian and sell trade silver to the Pakagon Band, ( Pokegnek Bodewadmik) of the Pottawatomie Nation in Michigan.For the purpose of re-educating their members to their old woodland ways. I am very proud of being part of that program and doing exactly what a historical silversmith would be doing 250 years ago. ​ My travels include many large events around the upper Midwest, where I sell my wares in the 3 seasons as well as indoor trade shows in the cold months. During my time as a silversmith I have also become a Master Mason and Past Master of Ancient, Free and Accepted Masons in Illinois. I make and sell numerous Masonic pieces to celebrate that craft. I hope I get to meet new members of the Coalition of Historic Trekkers but I have a feeling that I already know many of you. I can be found on Facebook or on my website. Cousin Dave Silversmith. ​My seminar will include discussion of symbolic elements, history of creating and usage of trade silver for woodland Indians of the east coast and Great lakes region from 1620-1820. 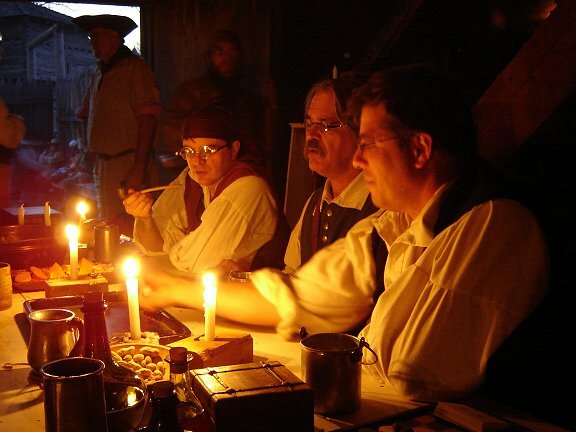 As always Tavern Night begins with our famous rum ration! Come enjoy period games, music and camaraderie for all ages! Of course there is the never ending pitcher of hot buttered rum, made by our very own Lauren Joyce! ​Christopher Hartman grew up in Dallas, Texas, where he worked as a professional actor after receiving his Bachelor’s of Fine Arts from the University of Oklahoma. Soon after moving to Virginia in 2014, he joined the Colonial Williamsburg Foundation as a character interpreter. Since then, he has taught period games, studied and written 18th century poetry, composed original music and plays in the Early American style, and overall has gained a love for history. Currently, Chris is engaged in research about and the portrayal of St. George Tucker, an important figure in the formation of the United States. First-person interpretation creates unique experiences for visitors, and Chris is glad to be part of the process of connecting modern guests with their historical roots. Meet with St. George Tucker as he reads from his Journal of the Battle of Yorktown, and reminisces on the aspects of war as a veteran of the American Revolution. Learn how to combine knowledge with appropriate techniques to make meaningful connections with your audience. ​ Is an independent scholar and author in the field of frontier research. He has published in numerous magazines and journals and has been involved in the hobby of living history since the advent of the Bicentennial in 1976. He lives in the greater Kansas City area and enjoys living history and trekking. Between 1735 and 1748 hundreds of young men and their families emigrated from the Scottish Highlands to the Georgia coast to settle and protect the new British Colony. The trustees of the Colony and military governor James Oglethorp wanted settlers who were accustomed to hardship, militant in nature, and willing to become frontier farmer-soldiers. In this seminar we will examine the clothing and the kit of a highland citizen soldier as he appeared on the frontier. 18th century Tavern music provided by Dacotah Hartman of Colonial Williamsburg!